Much more than just a DJ, Andy C is a true figurehead for the drum & bass movement, within which he has been an instrumental player since its very beginnings; his DJ sets and own seminal productions helping to evolve the genre through the many stages of its evolution. Following the joint success of the Ram Records website, Clocked Web Development has again provided the technical and design expertise in association with Underground-Music.co.uk to deliver Andy C an effective web platform to showcase his groundbreaking music and live DJ events. 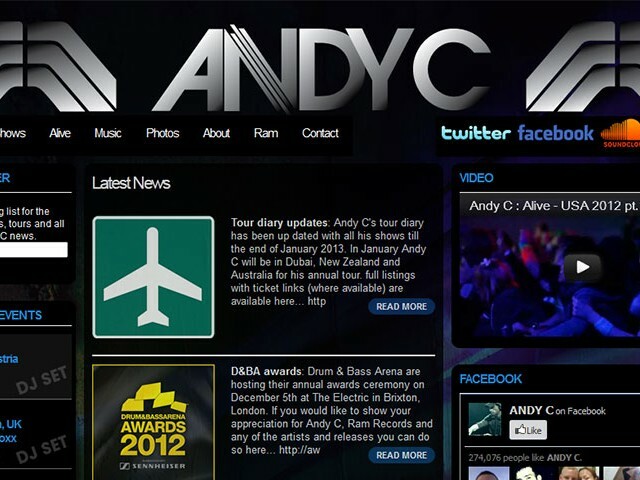 Built on the WordPress CMS platform to provide easy in-house management of news, events and discography, the Andy C website is always undergoing updates and further developments to follow the journey that so far has taken Andy C from sneaking into raves in barns as a 13 year old, to the glamorous terraces of Space in Ibiza and being invited to speak at Oxford University.